Biosynthesis of trichothecenes requires the involvement of at least 15 genes, most of which have been targeted for PCR. Qualitative PCRs are used to assign chemotypes to individual isolates, e.g., the capacity to produce type A and/or type B trichothecenes. Many regions in the core cluster (consisting of 12 genes) including intergenic regions have been used as targets for PCR, but the most robust assays are targeted to the tri3 and tri12 genes. Quantitative PCRs, that work across trichothecene-producing members of the Fusarium head blight complex, are described along with procedures to quantify the amount of fungal biomass in wheat samples. 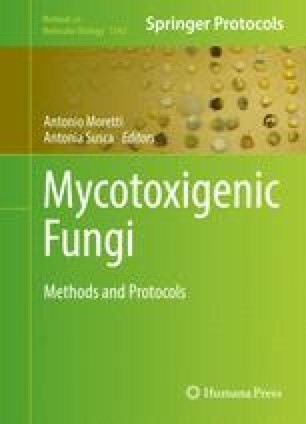 These assays are directed to the chemotype(s) present in field samples and quantify the total fungal biomass of trichothecene-producing fungi, irrespective of their genetic identity. This work was supported by the MycoRed project (FP7 Food Quality and Safety Priority—Large Collaborative Project—GA 222690) and the Dutch Main Board for Arable Products.